Simultanteously today, both the Daily Mail and the Daily Express published articles bemoaning the most ‘work-shy’ regions of Britain. Express: “Employment minister Mark Hoban said: “The old system condemned far too many people to a life on sickness benefits with little help to move back to work. Now people who can work will be given the long term help they need to find a job, while those who need unconditional support will get it.” Incapacity Benefit has been replaced by Employment and Support Allowance as part of an overhaul of the welfare state spearheaded by Work and Pensions Secretary Iain Duncan Smith”. Mail: “Mark Hoban, Minister for Employment, said they will now get long term help from Jobcentre Plus and the Work Programme to find work. He said: ‘The old system condemned far too many people to a life on sickness benefits with little help to move back to work. ‘This is a huge waste, but now people who can work will be given the long term help they need to find a job which is right for them, while those who need unconditional support will get it.’ Incapacity Benefit has been replaced by Employment and Support Allowance as part of an overhaul of the welfare state spearheaded by Work and Pensions Secretary Iain Duncan Smith”. Express: “Under the old regime lay­abouts could avoid work by claiming spurious medical conditions, like acne, because there were no regular checks”. Bizarrely, the Mail concluded by quoting a TUC official , who bemoaned the government peddling junk statistics, as will prove highly pertinent. However, it stratified ESA claims/outcomes into two distinct groups: new claims, and reassessments. The proportion of successful claims differs markedly between these two sets of people; as does the overall rate of assessment. 48 per cent of claimants were assessed as Fit for Work (FFW) and are no longer eligible for Employment and Support Allowance. This is prior to any appeal; and constitutes fewer than half of new benefit claimants. 4 per cent of claimants were still undergoing assessment. So, clearly the sweeping nature of the Mail/Express/government ministers is woefully inadequate to convey the highly complex reality of assessment outcomes. How about the derogatory rhetoric of people being ‘workshy’? “This map of Britain reveals the ‘workshy’ spots around the country where people claiming incapacity benefit claimants are actually fit enough to work. The Government introduced tough new health tests for those who claimed to be too unwell to get back into employment two years ago. Since then some 203,000, 30 per cent, out of 700,000 receiving the old Incapacity Benefit were declared fit to find work”. This stat in its own right is highly noteworthy: if the vast majority – 70% – of people assessed are being found totally or partially incapable of working, then the benefit itself is hardly beset with fraudulent claims. But let’s look at the actual local authority cases cited by the Mail, in order to see how it – and the people who briefed the two papers – are misinforming people. The DWP source for this data was Table 11: “Incapacity Benefits Reassessments – Outcomes of Work Capability Assessments adjusted to account for the outcome of appeal by month of referral, Regions and Local Authorities” in the tables section of the April 2013 Quarterly Bulletin release. 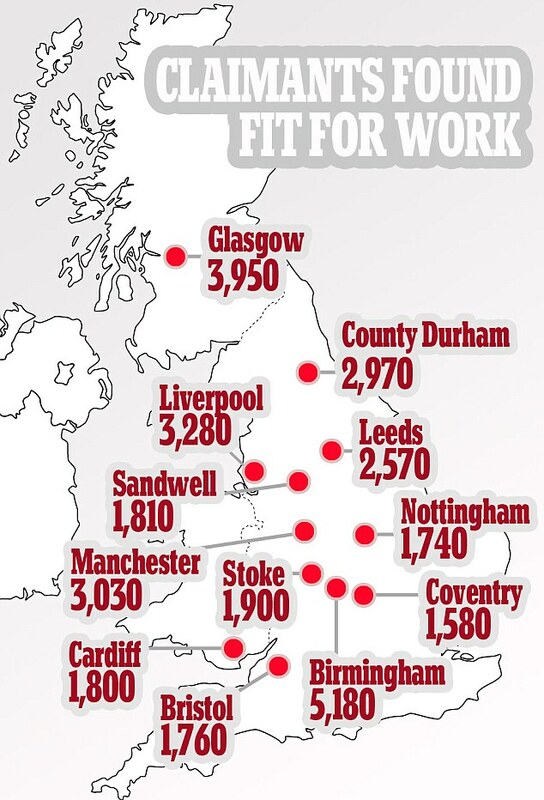 So, even though these cities have the highest number of people declared fit for work, the actual ratios are overwhelmingly consistent with the national mean-average. Even without considering the complexities of work capability assessments, it is evident that these are certainly not areas over-populated by ‘the workshy’ – that is, people who have been subject to the highly problematic work capability assessments, and declared capable of working. “there is no clear trend in entitlement for the majority of the series, however recent quarters show an increase in those entitled to ESA and corresponding decrease in those found fit to work. There is more of a pattern in placement into groups after the bedding down of the benefit, with distinct growth in the SG and decline in the WRAG from March 2011, and this – might be again due to changes made to the WCA based on reviews outlined above. These statements should not be interpreted to mean that the above are more than likely factors on the series – there may be others at work as well”. It’s also vital to put all of this in proper context: at least 30% of appeals are successful – but there is still no penalty applied to Atos, for carrying out the assessments and getting such a huge proportion wrong. The people subject to these assessments are sick, or severely disabled. Thousands of people have died after being declared fit and healthy. It is highly likely that people in these same circumstances are among those being dismissed as ‘work-shy’. In light of this, the actions of the government, Mail, and Express are distinctly odious.